Thanksgiving Baskets Delivered - Done in a Day! The Rotary Club of Leesburg participated in the Rotary District 7610 community service project "Done in a Day" on November 21, 2015. 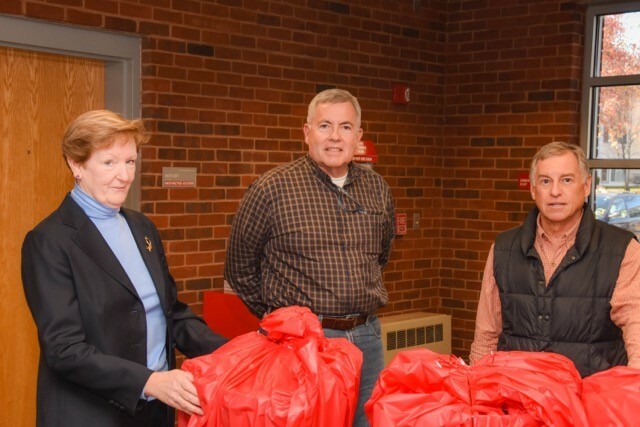 Leesburg Police Chief and Rotarian Joe Price, Club President Dee Jonas and Community Service Leader Ron Rogos delivered five Thanksgiving baskets to very appreciative families at the Leesburg Police headquarters on Saturday. Price spearheaded the collection of the food, and had identified five families who were in need of some extra help for the holiday. The families met President Dee who talked briefly about Rotary and the club’s community service activities. The parents and the children were very grateful for the Club’s generosity in filling the baskets. Pictured below are Dee, Joe and Ron with a couple of the baskets chock full of food and gift cards.